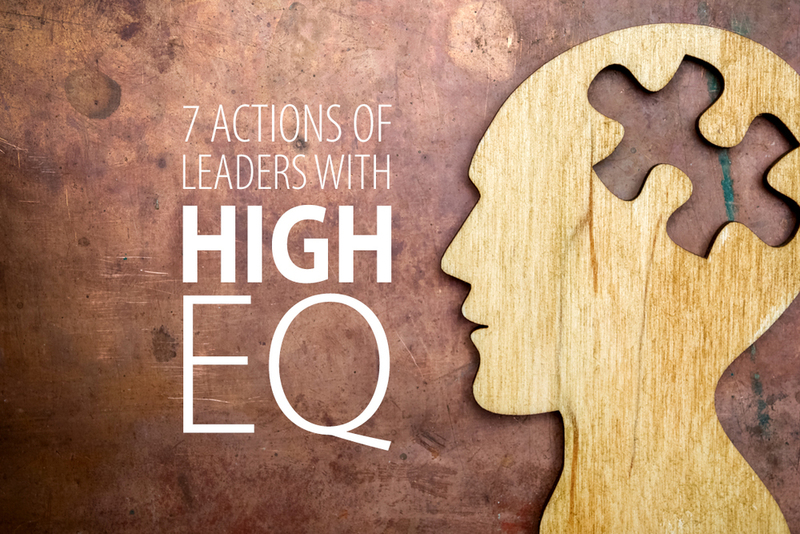 I have commonly seen EQ Leaders performing the following actions in order to be healthy leaders and encourage relational glue among their team members. In your pursuit of becoming a more emotionally intelligent leader, try implementing these seven practices. It’s okay to just be you. The standard is growth, not perfection. EQ thrives in the world of reality and truth. Pretenders have to hide because the notion of transparency is threatening to the image they have created and are trying to maintain. Such leaders often manifest a passive-aggressive style of leadership. This insulation to vulnerability will likely prevent others from giving the type of honest feedback that is needed for leaders to grow their EQ. However, vulnerability needs to come with discernment. Emotionally intelligent leaders are able to assess the situation and share appropriately while avoiding the act of oversharing. Proper assessment can bring clarity to the leader regarding his or her capabilities, compatibilities, and capacities for leadership and work. Since no one has the “whole package” of gifts and abilities, we are wise to discern what strengths and weaknesses we naturally bring to the leadership table. We highly recommend that leaders who want to grow in emotional intelligence arrange an externally-facilitated Leader 360 Feedback Process which includes gathering anonymous perspectives of how others see you as a leader. Leadership maturity does not occur in a vacuum; we need accurate and personal input from others so we can identify strengths and possible blind spots. A common characteristic in high functioning leaders is their ability to establish boundaries that are consistent with their own leadership DNA. They have decided what they will and will not do. They do not waste their time and effort trying to do something or be something they were never intended to do or be. Instead, they pour their concentrated effort into developing the person they are, not what others think they should be. Who is on your team? Ideally, we should each have a minimum of two teams. The first team you should build is an unofficial team of personal truth-tellers. This team is willing to say the hard things in a skillful way. In the Bible, Ephesians 4:15 tells us to “speak the truth in love.” This team of encouragers may be from within or from outside your organization. They can be mentors, coaches, or friends. The most important thing is to have regular contact with these types of people. A second team you should invest in is your work team. GREAT teams don’t happen accidentally, they require focused intentionality. The key is to be able to promote unity by using relational connections more than relying on positional power. Increasing the understanding of EQ among team members will help produce more satisfying and productive results. Simply doing popular “team building events” will yield only limited benefits if used without the concepts of EQ being imbedded. Try designing a fun and interactive training exercise for your team to begin to understand the key concepts of EQ. A notable benefit for individuals and teams with high EQ is the freedom to plow and pursue new ideas without fear of rejection. Without strong relational glue, there is a natural resistance to sharing knowledge, skills, and power. Self-preservation will win every time if key members of the team feel threatened by conflict or if someone is constantly pulling rank. Mature leaders have nothing to prove; their egos have been trained to not react defensively when dissenting opinions surface. Why? Because they are secure with whom they are, and they have built relationships that are sustained by trust. Even though they may not be catalytic in their leadership, the brightest EQ leaders know that to have lasting positive change, they need someone who possesses expertise in reading and relating well to those who will implement the change. Perhaps you have noticed that when momentum is reinforced with relational glue, problems are resolved more easily, diversions into the trivial are less frequent, recruiting volunteers for the cause is easier, resources are gathered faster, and celebrations are needed more often as milestones are reached more quickly. Every high quality electric model train has a vital piece of track called the re-railer. When the train passes over that particular piece of track, the wheels are realigned for the next smooth trip around the Christmas tree. The sustainability of leaders requires time for reflection and recalibration. Show me a leader that is able to show empathy, deepen friendships, and contribute to important networks, and I will show you a leader who understands the importance of contemplation and self-reflection. You can’t give away what you don’t have. Keep your reservoirs full. Remember, your emotional maturity is important because your team will follow your lead. For more on becoming an emotionally intelligent leader, read the article "Making Relational Glue" in our book FIT – Improving the Leadership Health of Yourself and Others. Dave has over 35 years of church ministry experience including 23 years as a senior pastor. His consulting experience includes ministry assessment, leadership coaching, and strategic planning. Dave’s degrees include a B.S. in Bible, a M.S. in Organizational Leadership and a D.Min in Leadership.